Reds captain Jordan Henderson is divisive among Liverpool fans to say the least – but one image on Twitter certainly didn’t help those who defend the number 14. Not one of the midfield three had good matches, with Gini Wijnaldum largely anonymous and James Milner contributing little apart from a coolly taken penalty, but Henderson’s decision making on one occasion was particularly frustrating. Henderson doesn’t deserve the abuse he sometimes has to put up with, but that image was certainly not the best moment for him. 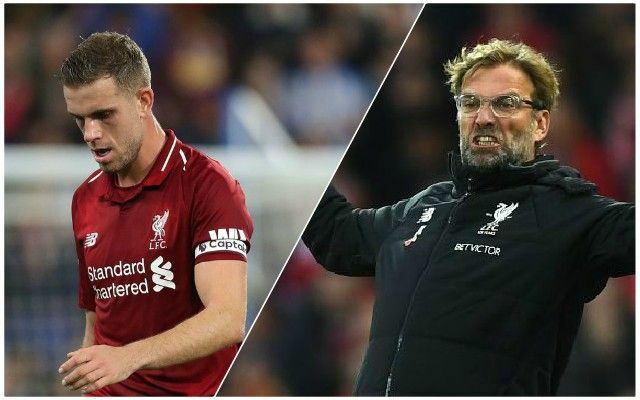 On a night when the Reds were struggling massively with linking the midfielders and the attackers, going backwards in that scenario left lots of fans understandably annoyed. Neither Wijnaldum nor Milner managed much in the way of positive attacking play on the night, so Henderson was not the only one at fault, but this particular moment was especially enraging. That will certainly have to change if the Reds are to go through against Napoli in a couple of weeks.